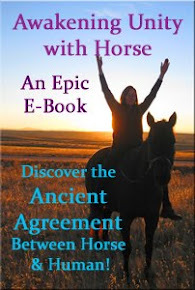 Equi-Heart Pledge: Day 24: An Energy Healing Session with Horses- Reconnecting with Your Higher Self! 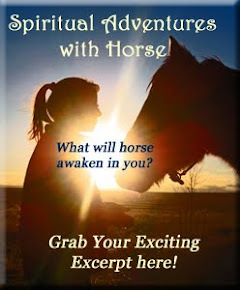 Day 24: An Energy Healing Session with Horses- Reconnecting with Your Higher Self! So, I've been resisting a part of my Higher Self for awhile now....sort of like a whiny kid, shouting, "NO, you can't make me!" Which isn't really the best answer to give when your higher self comes calling. Ha! Thankfully, the Whole Healing Herd came to the rescue today by offering me a self & equine guided, energy healing session and I decided to record the session and share it with you so you can see the healing magic that horses offer humanity! Horses heal in many ways, some more active, some just looks more passive (like what I will show today). 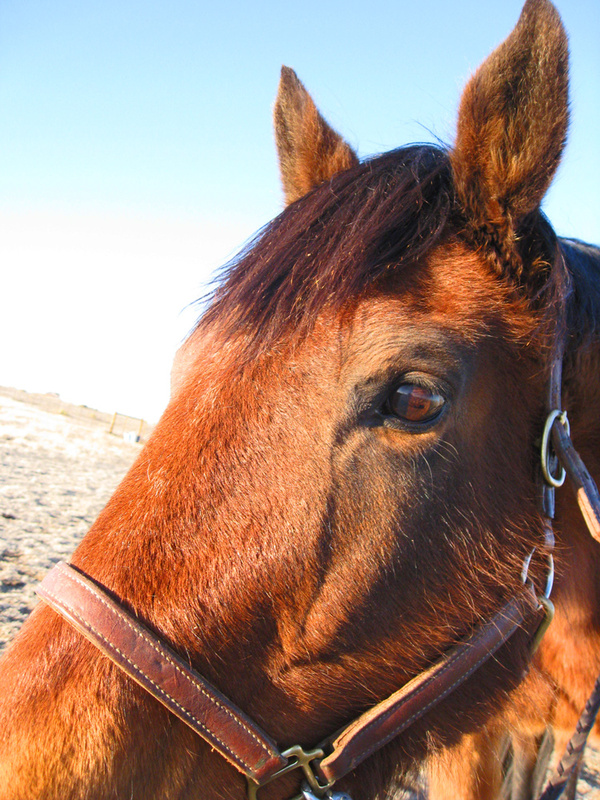 But even when it doesn't look like they are doing much, Horses are Master Energy Healers. Just like human energy workers, they have the power to help you shift and transform your energy field, when you enter the Sacred Soul Space with the intention to heal with their support. And, if you are looking closely, they give all sorts of subtle signs that they are working with you, such as yawning, licking & chewing, shaking thier necks, sighing, deep breathing, coughing, etc. All physical confirmations that things are shifting energetically. So join with me on this journey I took into the Sacred Healing Space with the Herd today....the session took about 30 minutes, so I edited it down to about 12 minutes and I narrated it so you can know what was going on for me and the herd during our silent, healing time together. What is so amazing about this kind of healing work with horses is that my entire herd will "Drop into the Zone" and pretty much stay there until the work is complete- they barely move for more than 30 minutes. You can't see the whole herd in this picture, but all five of them are around me and stay that way the entire time. Even the horses who are not directly interacting with me are working with me, supporting the process of energy transformation. They literally work together as a Team to create massive shifts in your energy field. This session was finally completed with some on-top time with Seren...I knew it was called for- since the horses can often help us really anchor the shifts if we spend some time on top of them. So I came back with a halter and simply asked, "Who wants to go for a ride?" Seren rarely offers to ride first. But there she was, answering the request by being the only one to lick and chew. And once haltered, she licked and chewed some more to confirm our decision. 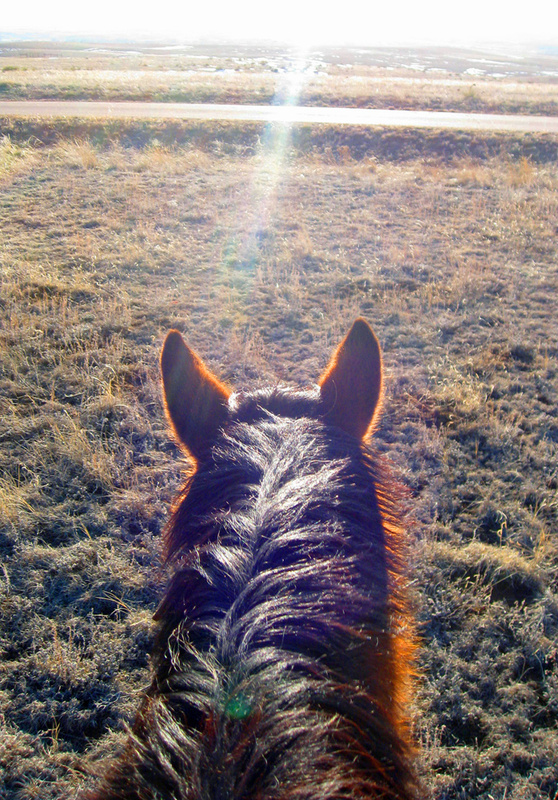 Once on top, she reminded me to use the Sacred Chalice exercise, found in our e-book Awakening Unity with Horse. So from the mounted position, I connected my newly present divine self, with my earth heart, Seren's heart, and Mother Earth, and from there, we dissolved the last remaining vestigages of the old pattern's energy and in it's place, we anchord the energy of Flow. And as we went for a short walk- we anchored FLOW into every cell and every system, so that by the time this whole healing session was over, in under an hour- no longer was I stuck in the hunkered down energy of doing nothing, but I was plugged into the divine flowing energy of my Higher Self. That's what I LOVE about this work!!! Let me tell you- it is a MUCH nicer place to be! And I thank the herd for helping me to access it and thank myself for showing up to engage the process so I could move to the next step on my own journey. With horses, showing up is half the battle! From there they will work with you to support the process. Which part of your Higher Self wants to rejoin you? 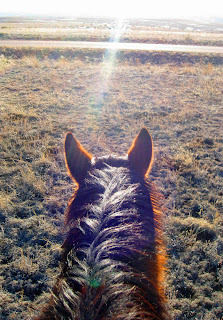 Join with some horses to reclaim your Magnificent Brilliance today! Here is Seren's energy from today. aspect of your missing Higher Self!